I participated in the Save the Light Half-Marathon for the second time this year. 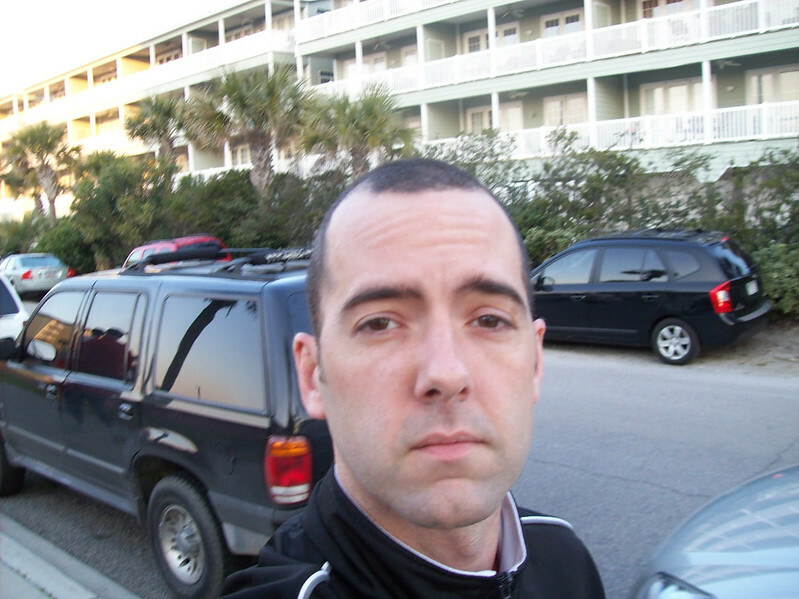 As you can see from the photo, I didn’t get much sleep the night before. All my fault, I admit. I hadn’t even really trained for this one, but I did okay at the Charlie Post, so I figured I would just cruise through it and enjoy myself. My primary camera is out for repairs, so I had to use my backup camera for the second race in a row. It doesn’t take very good photos unless the light is perfect, which is why I replaced it in the first place. Still, it’s better than nothing. I wouldn’t have wanted to go without it. That being said, please pardon any shots which seem to be washed out or too bright. Interplanet Susan… I mean, JANET! Below you’ll see a beautiful woman that I’ve met at various races. For months, and I mean that literally, I thought her name was Susan. I would see her for a total of maybe five minutes per race, and some of that included running alongside her on the course. I used to wave call out “Hey, Susan! Good race!” She would wave back and wonder why the hell I was calling her “Susan”. She corrected me a few times, but nothing seemed to stick until I started remembering her by a private nick-name. I dubbed her: Dammit-Janet. (I had recently seen Rocky Horror.) It took me a couple of races to get it locked in, and I still occasionally slip. As crazy as it sounds, this is how I make friends and entertain strangers. Susan and I have actually… wait, sorry… Janet and I have actually started to become race-buddies over time, which means that we compare times, talk about upcoming races, and she no longer waits for me to turn my back before pointing and laughing. So basically she’s just like all of my other friends. At our most recent event together, she provided me with an even better nickname that I really should have thought of first: Interplanet Janet. that’s perfect! I’ve always loved that song! Just to be on the save side, I googled Janet’s name and pulled up an older photo of her. She probably hates me now. This was a transition race. It started out cold, like the Charlie Post a week before, but it didn’t stay there. The temperature stayed pretty much above freezing throughout the morning. I needed my cold gear at first, but I was between a rock and a hard place. If I went without, I would freeze until the race started, and then again after the race ended. If I wore my gear, I would cook in it during the event. In the end, I kept the gear. I had gloves, my track jacket and some ear-warmers. Nothing drastic. After the fourth mile I stuffed everything into the jacket’s zipper pocket and tied it all around my waist. If you check out the photo below, you can see Ferris on the left. I was just doing crowd shots, so I didn’t even realize he was back there when I took it! 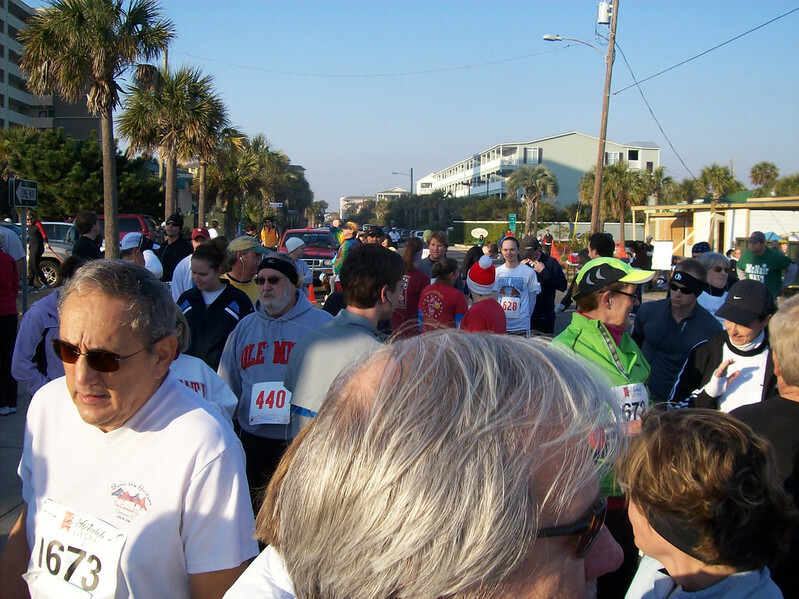 A half-marathon covers 13.1 miles, so you have to wind around Folly Beach a bit. Over all it was pretty much like last year except that I was stronger and better trained. My only real complaint concerns the cars which were on the course almost from the beginning. Seriously, if you can’t close the roads down, then don’t have the damned race. Some people were conscious enough to drive slowly, but others whipped around whenever they saw an opening. We’re all exhausting ourselves out there. The last thing we need is to be murdered by some idiot on their way to Wal-Mart. At several points we occupied both sides of the road, and cars wove their way through us. Maybe I seem a little harsh on this issue, but it’s a very serious issue. If you hold the race, hold the cars. No excuses. But enough of my soapbox. In my Flickr gallery you’ll see some spiffy photos of the race. I was a bit faster than a lot of my friends, so I took some photos at the Finish Line for them. 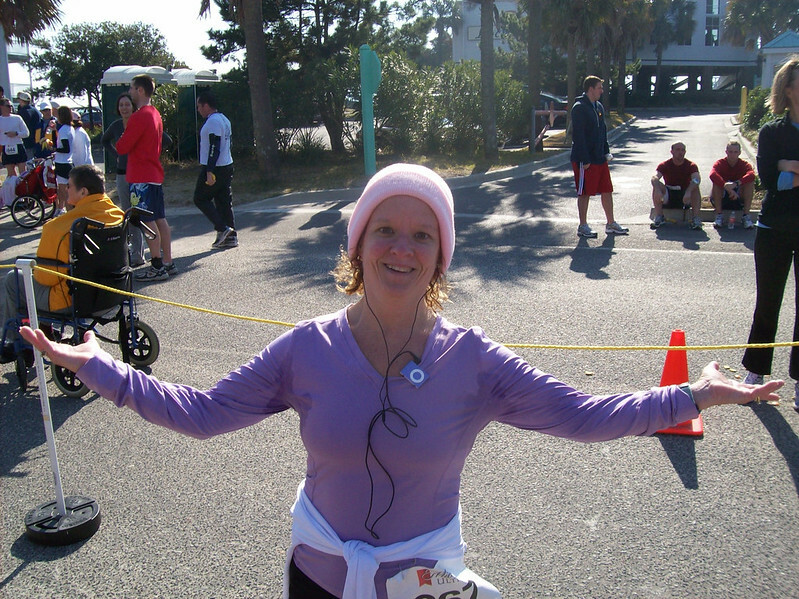 Donna Brown had run the 5K this time, so she was waiting there for us at the finish. Donna took the photo of me, of course. 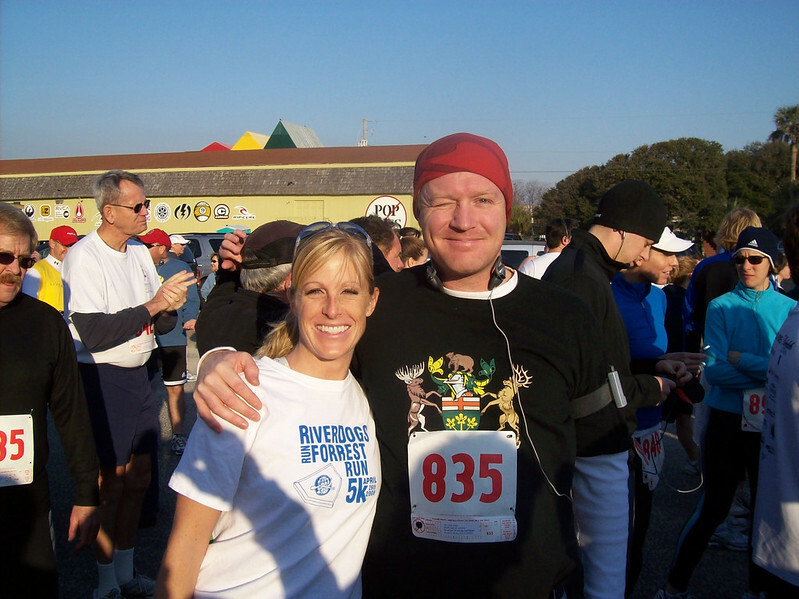 My buddy Jennifer was terrified of her very first 15K race last weekend, but she went out there and did just fine. Then she spent a week terrified of her first half-marathon, and once again proved herself wrong. The concern, the worry, the thoughts of just running the 5K event instead… none of it could stand up to the strength of her training. She worked hard, and she did great. Seriously, she’s alive and everything. Check her out below. I really have to thank Janet for this one. I paced with her for the first half of the race, and I gained several minutes as a result. I finished with a new personal record of 1:55:00. I couldn’t have done it without her. I stuck with Janet while it was helpful, and let her go ahead when it became unwise to maintain the speed. I also gave her a well-deserved hug after it was all over. I broke two hours… how cool is that?